I haven't been blogging lately because I headed back to school this fall after 20 years! I'm enrolled in the Digital Art and Design program (referred to as DAAD) and finding it overwhelming some days! I love what I'm learning and it really pushes my creativity. I'm also having to work on my time management skills as I have so many projects due every week and not enough time to work on them. I am learning to do homework every day so that I'm not waiting to the last minute to get something done...this really helps my stress load! I thought I would include a poster that I made for my typography class. We needed to combine type and an image and follow all the instructions to the letter...then we all show our projects to be critiqued (there are about 18 of us). It is definitely humbling to be with kids half your age who are creative geniuses but I am certainly learning a lot from them. This project worked out well because it's been a page I've been wanting to do for a long time! 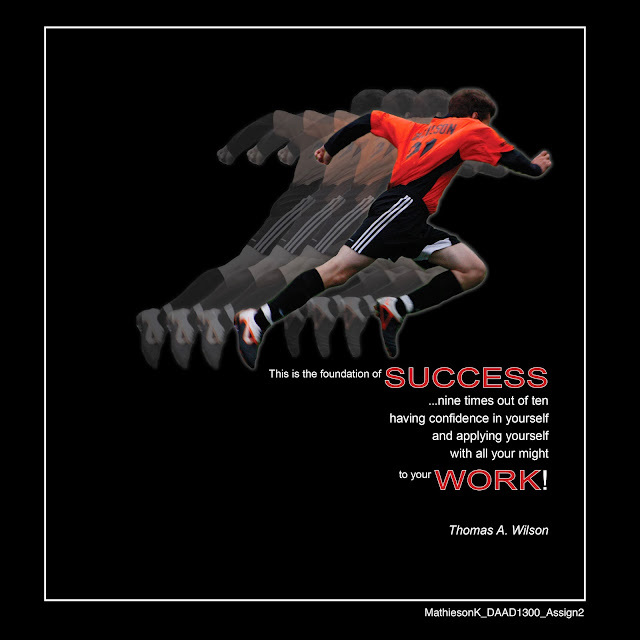 It was a Visually Enhanced Quotation and I used a favourite picture that I took of my Mitchell playing soccer and added it to a quote. I happily worked on it in Photoshop (extracted it, copied it, layered the opacity and moved it behind layers several times) and then worked on the type in InDesign. It's the learning Adobe InDesign and Adobe Illustrator that are the big learning curves for me....loving it and finding it frustrating all at the same time! Ketchup or No Ketchup. That shouldn't be a question.